It dawned on me, something that could open up eyes in this Rhodes institute of privileged kids who know no other way of life. My plan was to sit alongside that old barefooted hobo, who plays his guitar and stretches his vocal tracts day in and out along the kerbs of High Street. I was a bit nervous initially as I suspected him to be reluctant to have a stranger sit along side him to experience the life from the ground up. 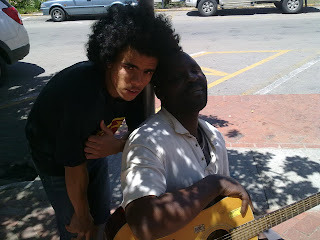 I did not expect a conversation due to the language barriers in existence, which was a pity as my plan was to extract some information that might have served as an inspirational stepping stone for me as a student who has done nothing but walk past this soloist on his way to Pick n Pay. The street is in its usual casual state with everyone tending to their own business, not a sign of a friendly handshake or a warm embrace – not by anyone. And there he sits. Under the tree, strumming away. ‘Molo Tata’ was all I could utter. He grins with droopy eyelids and I take a seat next to him. Not long after, the eyes start staring my way and I experience what it is to be looked down upon by the masses. I attempt to catch my new friend’s lyrics and sing along, but I am too intrigued by the passion with which he delivers his melodies. This man is content with his circumstance, it is clear as day. The hour I spent with my new friend was an experience that has humbled me even further and I actually felt so guilty when I got back to my res and found an expensive hoodie of mine lying on the floor alongside my bed. Nonetheless, it was experience gained through experiencing.